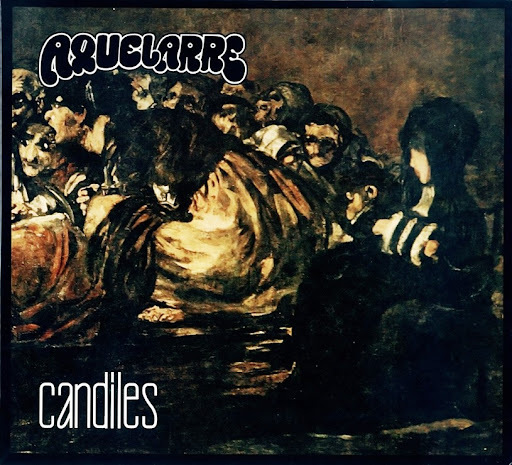 Aquelarre was formed by Garcia and Del Guercio after the break-up of Almendra. The band is often described as heavy progressive, but their first album contains six, basically slow to mid-tempo and mostly melodic numbers, with good guitar and keyboard work. The outstanding track is Ingador Campos Para Luchar, where the harpsichord recalls the album Reflections by the New York Rock & Roll Ensemble in collaboration with the Greek composer Manos Hadjidakis. On this track and indeed all over the record, there are some great guitar leads. The album's heaviest number is Movimento, which is based on complex guitar riffs. The album's stunning cover was drawn by Del Guercio and depicts the military coup shortly to take place in Argentina. He later became a graphic designer. Their second album featured a notable cover too. It reproduced the painting entitled "Aquelarre" by the Spanish Painter Francisco de Goya. Musically, the standout track was Iluminen La Tierra, the finale. They were becoming more progressive as evidenced by the keyboard-driven Miren A Este Imbécil, the energetic Cruzando La Calle and the rhythmic Cuentos Tristes. There's some fine guitar work on the fast-paced instrumental Patos Trastornados and some softer moments with Soplo Nuestro and Cuentos Tristes, which featured Del Guercio on flute. Prior to their most successful album Brumas they cut a single Violencia En El Parque, which has become their best known song. Brumas was premiered at the Coliseo Theatre in Buenos Aires. Its highlights included Brumas En La Bruma, a beautiful song with fine orchestration, Milagro De Pueblo, a complex number and the appealing Aves Rapaces and Parta Del Dia. After touring extensively to promote the album they relocated to Spain. Their final album Siesta was released there, along with a single featuring a non-album 'B' side. More keyboard-orientated than previous efforts, it made much use of synthesizers. It wasn't up to the standard of their previous efforts but still had some good cuts like Pájaro De La Locura featuring some appealing vocals and keyboards, Canto Cetrino, a laid back song with some melodic guitar and appealing vocals, and Siesta Cambiada is a pleasant six-and-a-half minute instrumental. They supplied one instrumental Mágico Y Natural for a compilation of Spanish groups in 1977 Ni Lo Uno Ni Lo Otro, Sino Todo Lo Contrario, but disappointed with the progress they were making in Spain then decided to split. Starc and Garcia were later in Tantor, a jazz-rock combo and Del Guercio also released a solo album in 1983.